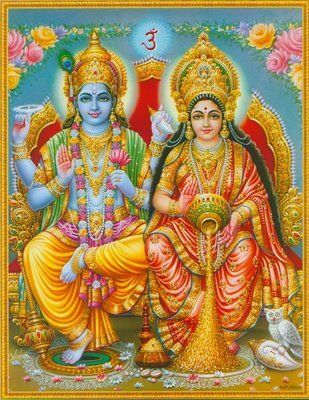 It is a bit misleading to post a picture allegedly depicting Vishnu, God of Heaven, and Lakshmi, Goddess of Earth, because they do not look like that. To create the universe, Brahma, the Divine Absolute, split into two parts. On a grand scale, the duality is God and Goddess, heaven and earth, but also inhalation and exhalation, yes and no, in and out, and so on, and even computer language is a binary system. Because Brahma split into heaven and earth, it is easy to locate them. Lakshmi has the appearance of all heavenly and earthly bodies, she looks like you and me and all living creatures. Everything of matter is the mother. Vishnu, on the other hand, does not have an appearance, because heaven encompasses all the space around matter. Although you have a connection to the earth, all around is heaven, so you can understand why the Sacred Teaching is to grasp for a large amount of air for holding within for staying together with in meditation. Here is a verse from the Veda about heaven and earth. And to come to be filled with, you know, to hear the knowledge.